1 A None No Power Seat 1 A has restricted legroom. The proximity to the lavatory may be bothersome. There is no under seat storage space in addition to no overhead storage for any A seats in Business. 12 A None No Power Seat 12 A is designated by Air Canada as a Preferred Seat. An extra surcharge must be paid to reserve this seat. This seat has some extra knee and legroom. Passengers seated here will also be the first to disembark. Elite level members in Air Canada's Aeroplan program may reserve this seat without charge. 12 D None No Power Seat 12 D is designated by Air Canada as a Preferred Seat. An extra surcharge must be paid to reserve this seat. This seat has some extra knee and legroom. Passengers seated here will also be the first to disembark. Elite level members in Air Canada's Aeroplan program may reserve this seat without charge. 12 F None No Power Seat 12 F is designated by Air Canada as a Preferred Seat. An extra surcharge must be paid to reserve this seat. This seat has some extra knee and legroom. Passengers seated here will also be the first to disembark. Elite level members in Air Canada's Aeroplan program may reserve this seat without charge. 13 C None No Power Seat 13 C is designated by Air Canada as a Preferred Seat. An extra surcharge must be paid to reserve this seat. This seat has extra legroom as the seat ahead of it is missing. However, the tray table and TV screen are in the armrests, making the armrests immovable and slightly reducing seat width. The overhead bin has limited storage space and there is no floor storage during takeoff and landing. Elite level members in Air Canada's Aeroplan program may reserve this seat without charge. 16 A None No Power Seat 16 A is a standard Economy seat that has a misaligned window. 16 F None No Power Seat 16 F is a standard Economy seat that has a misaligned window. 17 A None No Power Seat 17 A is a standard Economy seat that has a misaligned window. 17 F None No Power Seat 17 F is a standard Economy seat that has a misaligned window. 18 A None No Power Seat 18 A is a standard Economy seat that may have limited recline and a misaligned window. 18 C None No Power Seat 18 C is a standard Economy seat that may have limited recline. 18 D None No Power Seat 18 D is a standard Economy seat that may have limited recline. 18 F None No Power Seat 18 F is a standard Economy seat that may have limited recline and a misaligned window. 19 A None No Power Seat 19 A does not recline. This seat has no window but does have some extra legroom. 19 C None No Power Seat 19 C does not recline due to the exit row behind but does have some extra legroom. 19 D None No Power Seat 19 D does not recline due to the exit row behind but does have some extra legroom. 19 F None No Power Seat 19 F does not recline. This seat has no window but does have some extra legroom. 2 A None No Power Seat 2 A has a misaligned window. There is no overhead storage space for any A seats in Business. 2 D None No Power Seat 2 D has a misaligned window. The proximity to the lavatory may be bothersome. 2 F None No Power Seat 2 F has a misaligned window. The proximity to the lavatory may be bothersome. 20 A None No Power Seat 20 A has a slightly reduced seat width. 20 C None No Power Seat 20 C has extra legroom but does not recline. 20 D None No Power Seat 20 D has extra legroom but does not recline. 20 F None No Power Seat 20 F has a slightly reduced seat width. 21 A None No Power Seat 21 A is designated by Air Canada as a Preferred Seat. An extra surcharge must be paid to reserve this seat. Elite level members in Air Canada's Aeroplan program may reserve this seat without charge. This seat has a slightly less padded seat base. 21 C None No Power Seat 21 C is designated by Air Canada as a Preferred Seat. An extra surcharge must be paid to reserve this seat. There is some extra legroom at this row with full recline. Elite level members in Air Canada's Aeroplan program may reserve this seat without charge. 21 D None No Power Seat 21 D is designated by Air Canada as a Preferred Seat. An extra surcharge must be paid to reserve this seat. There is some extra legroom at this row with full recline. Elite level members in Air Canada's Aeroplan program may reserve this seat without charge. 21 F None No Power Seat 21 F is designated by Air Canada as a Preferred Seat. An extra surcharge must be paid to reserve this seat. Elite level members in Air Canada's Aeroplan program may reserve this seat without charge. This seat has a slightly less padded seat base. 23 A None No Power Seat 23 A is a standard Economy seat that has a misaligned window. 23 F None No Power Seat 23 F is a standard Economy seat that has a misaligned window. 24 F None No Power Seat 24 F is a standard Economy seat that has a misaligned window. 25 F None No Power Seat 25 F is a standard Economy seat that has a misaligned window. 26 F None No Power Seat 26 F is a standard Economy seat that is missing a window. 27 D None No Power Seat 27 D has limited recline. The proximity to the lavatory may be bothersome. 27 F None No Power Seat 27 F has limited recline. The proximity to the lavatory may be bothersome. This seat also has a misaligned window. 28 A None No Power Seat 28 A has limited recline. The proximity to the lavatory may be bothersome. 28 C None No Power Seat 28 C has limited recline. The proximity to the lavatory may be bothersome. 3 A None No Power Seat 3 A has a misaligned window. There is no overhead storage space for any A seats in Business. 4 A None No Power Seat 4 A is a standard Business Class seat however, there is no overhead storage space for any A seats in Business. There are 16 of this aircraft type in the fleet which are owned and operated by Air Canada Jazz - an Air Canada subsidiary. Inflight services and product is consistent with Air Canada mainline. This aircraft is used on short-haul domestic and transborder flights. Seats 18A/18F should be red due to no recline, and a missing window. Other than that, the CRJ705/900 is not the best - while the legroom is good, and the seats aren't bad, the inflight entertainment is really slow, the overhead bins are small, and the windows are small. I loved this plane. So nimble and quick. No fuss no muss. My family barely got on this plane, we were almost late so thats why i got 12 C For no extra charge, most of the comments about this seat say "the plane is now upgraded" or "i couldn't watch my Television during takeoff and landing" Listen guys, stop whining. When i was on this seat there was none in front of me, i wasn't bothered by the fact i couldn't take out my tv during takeoff and landing, this seat was amazing overall and it had so much legroom, great to stretch out. And listen if theres no ground storage for your bag, just put it in the overhead Bins! Good standard business class seat for domestic/transborder flights, especially for a regional jet. Decent amount of arm and legroom and quite comfortable with plenty of recline (though not lie flat). There's no oven on the plane, so meals are cold, but they were quite good for a small regional jet. As of November 2017, the IFE system was new and having issues, so don't plan on having a working IFE or wifi available (hope for the best, but keep expectations low). Air Canada has reconfigured most of the CRJ-705s to be CRJ-900s. This means there is now a seat 12C in front of 13C, so there is NOT extra legroom. If the seat map offers this seat as a preferred seat, don't take it. You won't get extra legroom and then you'll have to deal with the hastle of waiting to deal with Air Canada for a refund. Air Canada has reconfigured all, if not most, of their CRJ-705s to be CRJ-900s. This means there is now a seat 12C next to 12A. You have non-moveable armrests, a seat that is narrower than most, a tray table built into the side wall taking up legroom, and now someone next to you taking up arm space. Not worth the extra legroom. The window is not misaligned, there is no window at all. There is also no recline and people will brush by you to go to the bathroom. Pitch isnt bad unless the people in front of you decide they want to recline. This seat is in an exit row and has extra leg room. The seat is very narrow and hard. Very uncomfortable for a 4 hour + flight. Tray is in arm rest and seat does not recline. Cafe service may have been available but was not offered. Passengers in rows 18, 19 and 20 all complained about their seats being small and uncomfortable. The business class seat in front of you is not directly aligned in front of you. Because of this mis-alignment, the seat back entertainment screen is to the left of your view. Unfortunately the curtain was also in the way and blocked the screen. Annoying. Made the mistake of paying for this seat. It is noticeably narrower and I missed the pocket storage in front of me more than I expected. The TV in the armrest was also a pain because it couldn't be out while taking off or landing, while everyone else could continue watching their TVs. Not worth the extra charge. Roomy for a commuter jet. Especially for a 6 footer. Charging outlet for phone was a plus. Bring your own headsets or pay a couple of bucks for throwaways to enjoy inflight entertainment. 18A and 18B actually all row 18 don't have access to a window. We got window seating with no window. The exit row is behind row 18 and it has windows. Avoid row 18 if you want a window. Seat map doesn't show that these seats don't have access to windows. The window seats in row 20 do not recline but are not marked as such on the seat map. They are also cramped because of the curvature of the plane at this point. My tall husband spent a very uncomfortable flight with his feet propped on his suitcase under the seat in front, and the headrest digging into his back. We had a seat mixup and I moved from seat 15A to seat 25A. The legroom at 25A was significantly better than for 15A. There was approx 4" more space between my knees and the back of the seat in front of me in row 25 than there was in row 15. The overhead bins are small so bigger bags have to go under the seat in front of you which restricts some of your leg room. A relatively quiet flight, and decent IFE. USB charge ports in the seats are great to keep your phone/tablet charged, especially if your battery is dying from usage during a layover. It's not a huge plane but comfortable. Great single seat behind Business on the CRJ705 aircraft. There are no solid bulkheads so there is room for under seat storage. Overhead bins are really small though so be aware! I flew a 12 hour flight on 787, then went on the CRJ - 705 for 2 hours. I only wish the 787 had the same legroom as the CRJ. Old but very comfortable airplane. Highly recommended for tall passengers who does not want to pay for extra legroom. Decent biz / first seat for connections to medium-stage flights (~3hr). Nice touch that AC actually has a luggage cabinet inside the cabin, so if the bins are full and you are in first, your bags don't get gate checked. This is really needed because the A/C side has no overhead bins in first (well, they do, but they don't really hold anything). The aircraft itself is ok. Legroom for me (I'm 6,2 ft) was ok too. Overhead bins for baggage is very small, so bigger hand-baggage has to checked in before borading, so it can be stored with the normal baggage. I flew this aircraft with Air Canada from Toronto to JFK and back, and every time it had at least 1 hour delay. 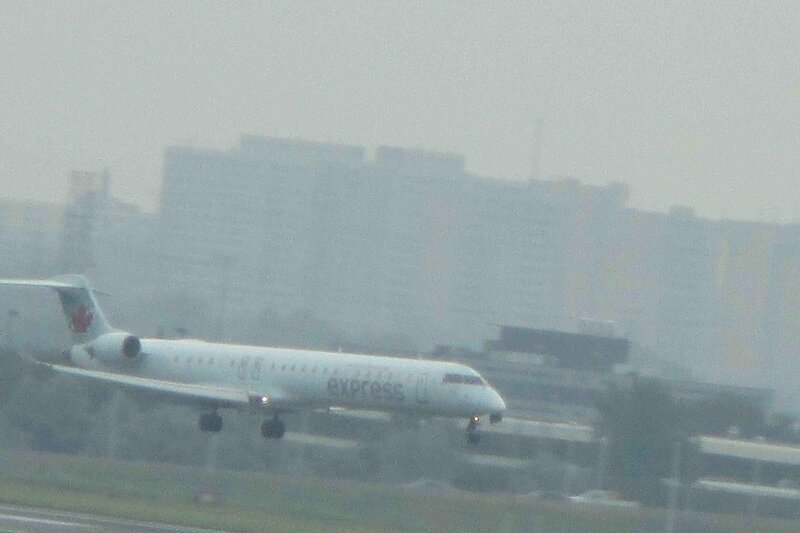 Air Canada flies 1 versions of Canadair Regional Jet 705.